The massive music+interactive+movies festival drew over 2,000 plus bands in the area. I thought I was done with all the previews for SXSW 2012, but clearly, I was wrong. There are actually way too many announcements to make any sense of it all, so I suggest if you're going, just use the official sxsw.com and figure it all out yourself. Just quickly, Barsuk Records' SXSW Showcase is taking place March 15th at Red Eyed Fly. I just saw the sweet, sweet Laura Gibson at 7th Street on Monday, so be sure to see her. Also on the bill: Nada Surf, Cymbals Eat Guitars, Maps & Atlases, Ramona Falls, Say Hi and Yellow Ostrich (which Lara is covering their Minneapolis show on Saturday). And just in time for SXSW, they have put together their playlist: Austin Power: SPIN's Best SXSW Acts 2012. It is a free download. □ Ava Luna – "Ice Level"
□ A.Dd+ – "Sh*t Got Crazy"
□ Bear in Heaven – "Sinful Nature"
□ Bleached – "Searching Through The Past"
□ Blue Sky Black Death – "Sleeping Children Are…"
□ Chelsea Wolfe – "Tall Bodies"
□ Cities Aviv – "Jaguar"
□ Class Actress – "Weekend"
□ Cloud Nothings – "No Future/No Past"
□ Django Django – "Default"
□ Dope Body – "Lazy Slave"
□ Hospitality – "Betty Wang"
□ Hull – "In Death, Truth"
□ King Tuff - "Wild Desire"
□ La Sera – "Break My Heart"
□ Main Attrakionz – "Bossalinis & Fooliyones pt. 2"
□ Mr. Muthafuckin’ eXquire – "The Gold Watch"
□ Natural Child – "Ain’t Gonna Stop"
□ Screaming Females – "It All Means Nothing"
□ Sharon Van Etten – "Serpents"
□ Spoek Mathambo – "Let Them Talk"
□ St. Lucia – "We Got It Wrong"
□ The Coathangers – "Smother"
□ Thee Oh Sees – "The Dream"
□ Thundercat – "For Love I Come"
□ Unknown Mortal Orchestra – "FFunny FFrends"
□ Xray Eyeballs – "Four"
□ White Fence- "Swagger Vets and Double Moon"
□ Widowspeak – "Harsh Realm"
□ Youth Lagoon – "July"
□ Zola Jesus – "Seekir"
We love The Hype Machine, please add us to your favorites. You can RSVP to their parties at hypem.com/hotel. If you aren't (or can't) attending SXSW, the good news is that you can Livestream. 12 AM Dale Earnhardt Jr. Jr. There is a need for people not attending SXSW to get the latest updates and live streams. Tunein is a free service that will be broadcasting SXSW shows. I did go to the website and was rather confused at where to go. However, according to their blog, there is an app you can download and all you need to do is search "SXSW". Full listing shows M. Ward, Howler (from Minneapolis! ), Nada Surf, Alabama Shakes, Andrew Bird, Sharon Van Etten, Magnetic Fields, Yellow Ostrich, Of Monsters and Men (from Iceland! ), Blitzen Trapper, and "the boss" Bruce Springsteen. 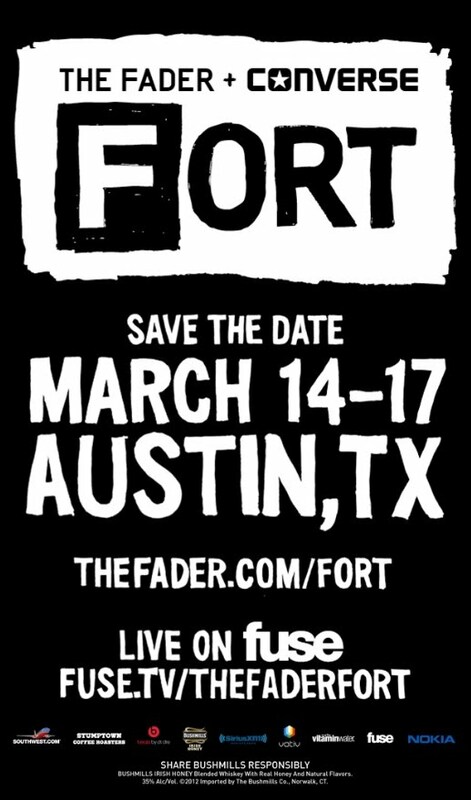 The Fader Fort is back SXSW, taking place March 14-17, 2012. The FADER FORT Presented by Converse is made possible this year by Nokia, Bushmills Irish Honey, vitaminwater, Beats by Dre, Votiv, Roberta's Pizza, Stumptown Coffee Roasters, SiriusXMU and Southwest Airlines. I am sick. I don't know how it happened, but it's not fun coughing and wheezing. I did manage to do two podcast recording, with Sally and Cristina, which will likely be edited for this week and next week's show. I also picked up The Witcher 2: Assassins of Kings, at Walmart, which came with a lot of bonus items like a DVD and Soundtrack (all at the normal cost of a game product). They are on the right track, I definitely feel like you get more value out of it, when this is the 'standard' version of the game. There is a collector's version, which is way too expensive for my blood ($129). Unfortunately, the game is plagued with problems. Activation was a nightmare (finally got it to work eventually), downloading bonus content wasn't working (it kept saying the code was bad, when in fact, it was the correct code - eventually this worked out), and the game does not work on my Nvidia 7800 SLI. I understand that this card is old, but I can run modern games on it just fine at 1280x720 (which I'm OK with). But seriously, they need to fix some of these bugs... but I don't think they will because their minimal support is Nvidia 8800 card, just a generation above mine. So, right now, it's not recommended if you have an older card. Since I can't really play it until they patch it, or if Nvidia update their drivers, I might actually go back to the first Witcher game, which I never finished. The bonus soundtrack is composed by Adam Skorupa & Krzysztof Wierzynkiewicz, and it's what you expect for a gaming soundtrack. The DVD is in Polish, so be prepared to read a lot of subtitles. I got the latest Spin Magazine in the mail today and it's pretty sweet that they are offering not one, but two, free albums this month. Like I've previously mentioned, it's free for all US residents. You can grab them at spin.com/itunes (expires June 30th) and spin.com/itunes-lolla (expires Aug 31st), what a good deal! Especially for Sleater-Kinney and Isobell Campbell. While you're enjoying the free music, you can consider subscribing the magazine. For one year, it's $9.95. I do recommend the print version, you get more content for the buck, and I've always been a fan of glossy magazines vs digital ones. Not to say that the iPad digital version doesn't have a lot going for it, but it just seems like the iPad version is more or less about pictures and very, very few words. The only advantage you have on the digital Spin Magazine is that you can stream the month's soundtrack, and "breaking" news is constantly flowing. I actually turned off auto-renewal for the Spin digital magazine, but I am definitely keeping my print subscription. That's not all, for late April and this month (May), you can purchase a 2-disc special Spin Magazine "Must-Hear Music" edition, available only at Target stores. For the price of the magazine $4.99, you get two 16-track bonus CDs, featuring Mumford & Sons (they are on the current cover), and The Strokes (they were on last month's cover). Update: Here is a picture of the Spin Target Edition next to my iPad with the Spin digital issue. As you can the see the Target Edition is a smaller print, you can find the issue at the music/CD area, not magazine area. Lastly, The Hype Machine (hypem.com) is a very popular blog music indexer. We were lucky enough to have been featured on their iPhone Application. As a result, we're getting a ton of mobile traffic, and suddenly the song we posted by Scattered Trees climbed up the Hype Machine's Twitter Chart. I think by the time you read this, it would've dropped off the charts, but here's a screen capture (see picture). Enjoy artwork and the ability to read each blog post behind the music directly within the app. Includes every blog in our Music Blog Directory as its own radio station. Don't know where to start? Browse music by genres like acoustic, british, dance, electro, experimental, indie pop, psychedelic, shoegaze and more.